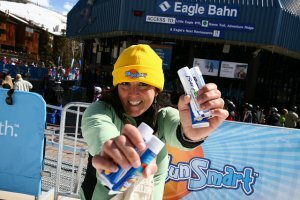 Ski SunSmart educates winter sports enthusiasts of cold weather sun exposure and how to best protect against those risks. Sun exposure can be just as damaging in the winter as it is in the summer. Most experienced winter sports enthusiasts know that they need to use sun protection to protect themselves from US radiation, which can lead to skin cancer. Researchers, however, have discovered there are as many variations in UV levels at ski resorts as there are inconsistencies in the way skiers and snowboarders use sun protection. The Ski SunSmart Program is a new initiative of the Live SunSmart Foundation that aims to promote the health and wellness of outdoor winter sports enthusiasts, in particular skiers and snowboarders. Our goal is to make the application and reapplication of sunscreen a normal routine on the slopes. Interested in learning more about our Ski SunSmart program? Help winter enthusiasts understand the importance of regular sun screen application even during those cold months! Join the Live SunSmart Foundation as an advocate for our Ski SunSmart program and receive free tools you can use to help educate those you know who enjoy spending time outdoors in the winter. Sign up now to become an advocate of our Ski SunSmart Program. For more information, contact us or give us a call at 973-744-3557. Hey snow bunnies, do you run to help keep yourself in shape year-round?Learn how to reduce your risk of skin cancer while keeping your training schedule on track.